"They went in haste and found Mary and Joseph and the baby lying in a manger, once they saw, they understood what had been told them concerning the child." 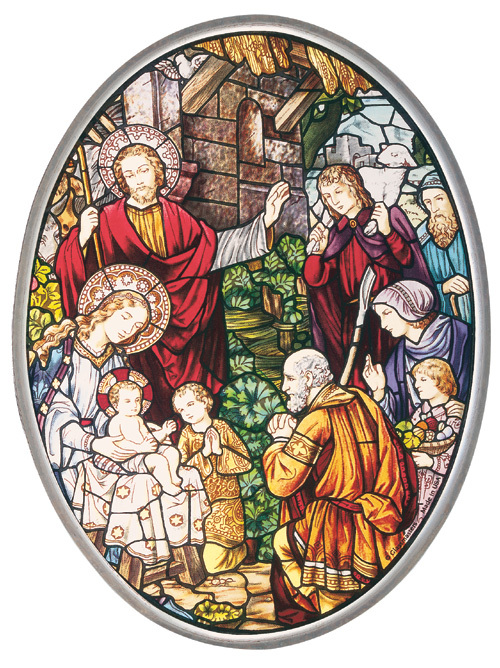 The Nativity Window is part of a series of windows depicting the Joyful Mysteries of the Rosary displayed on the east side of St. Michael the Archangel downtown church. As the morning sun shines through the deep rich colors of the glass, one is reminded of God's wonderful gift of "the Light of the world" born to us in a baby of lowly birth. Installed in 1889 when the church building was enlarged and remodeled, the windows in the nave of the downtown St. Michael the Archangel Church were produced in the Royal Bavarian Stained Glass Manufactory, Munich. This glassworks was established by King Ludwig I in 1827 and continued to produce glass of high quality well into the early 20th century, under the guidance of F.X. Zettler. Together with his major competitor, Franz Mayer of the Royal Art Institute, these stained-glass artists developed the so-called "Munich style" of expert painting on relatively large glass panels (as opposed to the medieval technique of smaller peices of colored glass held in a leaded framework).